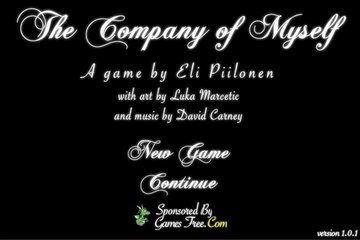 The Company of Myself, a short flash game, tells the story of a hermit. More importantly, it's a puzzle platformer that explores the idea of cloning your actions repeatedly to complete levels without anyone's help. The game is listed as one of the best games of 2009 on Kongregate and is one of the highest rated games on the site. The main character wears a tophat. Best time: Single-segment 0:03:27 by James 'Aftermath' Downing on 2011-05-02. I had a lot of things in mind to say while I was running the game (leading to many failures because of the distraction), but now it seems like there's not much to say. This is quite a fun game and was also pretty challenging to speedrun. It's a very low 3:27, which I was unable to beat, but perhaps someone with a better sense of timing could bring this time down. I started playing the game a few days ago when PSN went down and found that there was quite a bit of strategy that could go into timing all of the levels just right. There weren't any speedrunning resources for the game, so I came up with all of the strategies independently; hopefully there aren't any major blunders. The second-to-last level looks like I could get by with one less jump/clone, but the third one up always stacks, so I wasn't able to figure out a way to cut that out. As far as levels which could have tighter timing, the two levels with 4 switches and the level with the checkpoint are the ones which can definitely be improved. Anyway, hope you enjoy this short speedrun and thanks for reading these notes. Thanks to Mikwuyma, nate, and all of the updaters for keeping SDA great and letting runners dump all of the work onto them.